Now THAT’s how you land a rover! NASA’s Mars Science Laboratory “Curiosity” has landed inside Gale Crater in a damn-near perfect entry, descent and landing (EDL). What’s more, the first photos from the Martian surface were also received only minutes after confirmation of touchdown, depicting a wonderfully smooth plain littered with small rocks. 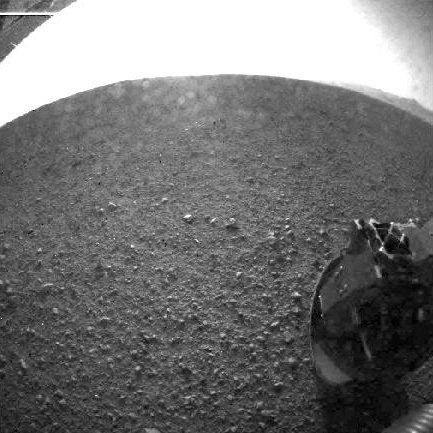 The first low resolution photo from Curiosity’s hazcam showed a horizon plus one of the rover’s wheels. And then a higher-resolution hazcam view streamed in. Then another — this time showing the shadow of the one-ton rover — an image that will likely become iconic for tonight’s entire EDL. The concerns about the ability of NASA’s orbiting satellite Mars Odyssey to relay signals from Curiosity rapidly evaporated. Curiosity had landed and it was already taking my breath away. After a long night in the “Media Overflow” trailer at NASA’s Jet Propulsion Laboratory, I felt overwhelmed with emotion. On the one hand, I was blown away by ingenuity of mankind — the fact we can launch such ambitious missions to other worlds is a testament to exploration and science in its purest form. But I was also overwhelmed by the spirit of JPL’s scientists and engineers who made this happen. I was humbled to be a member of the media covering the event from mission control. It was an experience I’ll never forget. Tonight is a night to forget politics, this is a night to celebrate NASA and the incredible things they do. I’ll post more soon, including photos from the event, but for now I need sleep. Truly This is a Great Day For Science and The History of The Human Race But Remember We Have Not Met Any Competition on Any Other Planet, Yet ! I Have No Doubt That Day Will Come, Perhaps Thousands of Years, Hence! So, We Seem To Have A Little” Breathing Room ” , For Now ! This is The Time to Invest in Education, Physical Fitness For Our Children’s Health, To Be Able to Endure The Rigors of Living Off-Earth For Extended Periods of Time ! These Days Will Be Remembered The Way , We Look Back On The Greeks and Romans, Plying The Unknown Seas And Fighting Irrational Fears of Monsters and Whatnot ! Let Us Go Bravely Into The Dark Canvas of Our Stellar Environ and Proceed With The Faith of Good Pilgrims! Previous Previous post: The Discovery Channel Telescope Is ONLINE!